What’s new on the tristinstyling blog? — No time to surf the web? No problem! You can sign-up to have blogs sent straight to your inbox! The first ever Serpico boutique will be opening tomorrow. Adjacent to their design studio which is in-store behind a silk curtain, they will be featuring experimental and one-of-a-kind pieces along with the current SERPICO collection. I’ve been to the space already and I love how parking is easy where they are located at 1514 N. Ashland Avenue in Wicker Park. Earlier this spring, I collaborated with Rachel from r.hanel photography and Krista Gobeli of facecandy.net to shoot a fashion calendar for 2008 featuring The Serpico FW08 Collection (click here to watch our behind the scenes video.). The thing I like about Serpico is the uniqueness and quality of each piece. Melissa the creator/designer/business woman behind it all really puts thought into each design. Her pieces are flattering. They can also create custom pieces so if you know what you want but can’t find it out there, try the Serpico Collection’s “made-to order” option. Right now the site features Buy it Now items ranging anywhere from under $100 for cute tops and cocktail dresses to a Mint condition Stella McCartney coat for under $500. Remember that (somewhere around $500) Nanette Lepore “Drop Anchor Jacket” that I was obsessing over last year after seeing it at the Nanette Lepore Vegas boutique? I didn’t get it because I couldn’t get myself to drop that much at the time. Check out the new Prop H8 shirt at blacklava.net. They are printed on American Apparels shirts and are going for a super cheap price of $9.95. Free button included while supplies last. 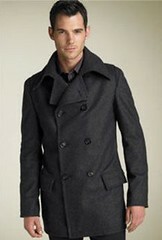 Ask tristinstyling: Where do I go to get a good deal on a mens pea coat? Where should I go to get a good deal on pea coat? As much as I love this Versace Collection Wool Peacoat (pictured left) with its handsome double-breast and notched collar, the $1,250 price tag is more than most want to shell out for a fall/winter coat so I made a list of my top 5 picks (below) for mens pea coats 2008. 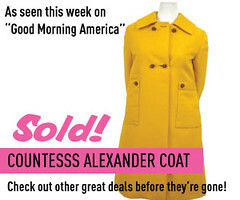 It is possible to get a good coat for a great deal. Click the links to purchase and/or view online and HURRY because some are on sale or available online only and may run out of stock quick! For even better deals, I suggest second hand stores like Crossroads Trading Company, Buffalo Exchange or discount stores like TJ Maxx, Nordstrom Rack. Ever find yourself tongue tied with how to pronounce a designer label such as Cartier or Bvlgari? Look no further because I’ve got the ultimate designer pronunciation how-to for your bookmarking pleasure thanks to the chic spy! I added some designers and made a few corrections but in case I missed any, feel free to comment below and I will make corrections. Below is an alphabetical how-to pronounce guide, on today’s hottest designers. Don’t see the pronunciation for a designer here? submit it in the comment box below and we will update it into the list! Enjoy! Michelle Obama’s Narciso Rodriguez Spring 2009 dress received a lot of negative feedback from fans and fashion critics online while 10-year-old Malia Obama’s bubble hemmed dress (pictured left) set blips of sales for high-end children’s clothing label, Biscotti Inc.
Sasha on the other hand, was wearing a $72 piece by Gerson & Gerson Inc. under the Iris & Ivy children’s label that sells at retailers like Nordstrom and Dillard’s. Barbara Zeins, president of Gerson & Gerson, will be bringing the style back in a different fabrication to be sold in the spring under the style name, Sasha. Lately, I think the fashion world has had a way with luring young girls into clothing choices that are too mature for their age and personally, I feel refreshed to see a young girl set a more conservative and traditional example with her wardrobe. Click here to read the article on Malia’s dress in The Wall Street Journal Blogs.